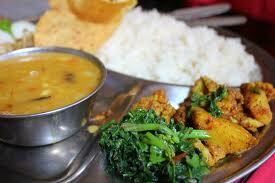 Last month I ate at a Nepalese restaurant and I thought I'd share my experience with you. My friend and I were in the mood for Nepalese food. There are quite a few Nepalese restaurants in Helsinki and I have eaten at a few of those, but we ended up going to Base Camp on Yliopistonkatu. I usually order a lamb dish at a Nepalese restaurant. I've ordered a chicken dish a few times but I love how tender and flavoursome lamb gets after simmering in the sauce for hours. No surprise then that I had a lamb dish that day. I asked the waiter for advise and he recommended Gulmeli Bhedo. According to the menu it is 'Lamb, potato and cauliflower cooked in tomato cream sauce with garlic flavor'. My friend, she is a vegetarian, ordered the Shahi Paneer which is cottage cheese in tomato cream, cashew nut sauce with almond flour flavor. While waiting for our food we got some poppadoms (a thin round crisp Indian bread) to nibble on. Our food arrived quite swiftly and looked delicious. We couldn't wait to tuck in. I could have kissed the waiter for his recommendation as my lamb was succulent and by far the best lamb dish I have ever eaten at a Nepalese restaurant. The sauce of my lamb dish was heavenly and the naan bread was soft and delicious. My friend enjoyed her dish too and we both finished every last bit of our meals. Our bellies were full and we were ready to leave so we asked for the check. The waiter brought the check and some yummy fruit toffees. Call me strange but I am always a bit disappointed whenever a check is not accompanied by sweets or chocolates. It's just not right. It's like wearing a bikini in winter (for us non-models) or taking your mom to a Harry Potter movie. While writing this I am craving the lamb dish again. I will definitely go to Base Camp again. As should you. 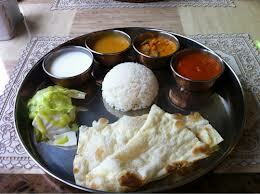 Tell me do you know any good Nepalese restaurants in the Helsinki area? Not e: these pictures are of Nepalese food but not the dish I had.